Jennie Troyer knows it's time to remarry, and with two men pursuing her, she doesn't have to look far. But after the pain she's experienced, can she open her heart to love? It's been four years since Jennie's husband died in a farming accident. Long enough that the elders in her Amish community think it's time to shed her grief and remarry for the sake of her seven children. What they don't know is it isn't grief that's holding her back, but rather a fear of a repeat of her abusive marriage. Paul Graber has known--and loved--Jennie since they were children, and he'd hoped to court her when they were teenagers. But when he was fourteen, Paul's father died suddenly in his arms. Ever since he's been afraid of the searing pain of loss that comes from opening himself up to love. Now Jennie's free again and he's fighting to have the courage not to lose her a second time. Nathan Walker is a Mennonite book salesman who makes it a point to stop by Jennie's farm as often as he can. He's grown to care for her, but he knows he has no right to court her unless he resolves his own struggle with his faith. He will have to change everything about his life in order to join the Jamesport Amish community. But would he be embracing a new life or running from his old? The path isn't clear for any of them. These three people, drawn together by circumstances and God's plan, must come to grips with their pasts in order to discern God's plan for their futures and find peace beneath the summer sun. 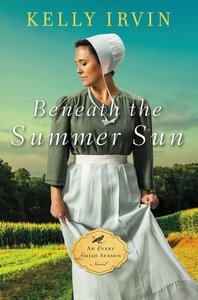 About "Beneath the Summer Sun (#01 in An Every Amish Season Novel Series)"